Dr. Noel Arrold and about 30 others on a tour of the Li-Sun exotic mushrooms tunnel. The tunnel was decommissioned in 1919 when a two track tunnel was constructed alongside, under Mount Gibraltar. It is a genuine feat of engineering, heft through about 650m of shale and sandstone. As well as taking along the bellows and SMC Takumar lens for macros, it was a great chance to test out the Laowa 12mm ultra wide lens in low light, and up close. It didn’t disappoint. At ISO 1250 (just before the Canon 6D starts showing grain), I rarely had to go down to f2.8 under the flourescent tubes. The lack of distortion and close focusing distance (18cm) helped create some splendid images. At the end of the tour everyone received a tray of produce, which we used straight away. 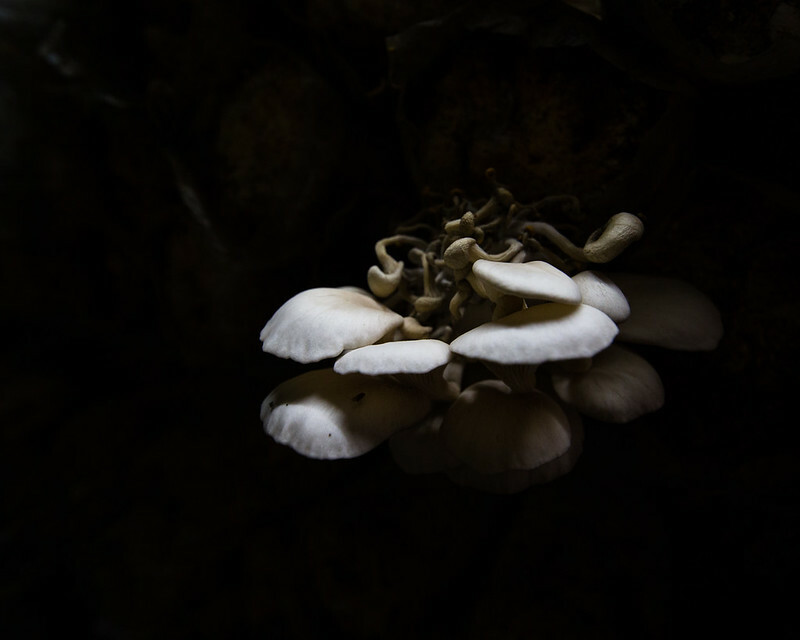 These receipes and background from the Mycological Society of San Francisco make for interesting reading on oyster mushrooms.